How did you come to a career in the Coming into the position, what are maritime industry? your near and longer term goals, and and vessels, I came ashore and found how do you plan to achieve them? Fergus Campbell riety of ships sailing by and wondering jor cruise ships and spent a lot of time our remote monitoring and maintenance what it would be like to work on them. in the U.S. during their drydock periods. capabilities. 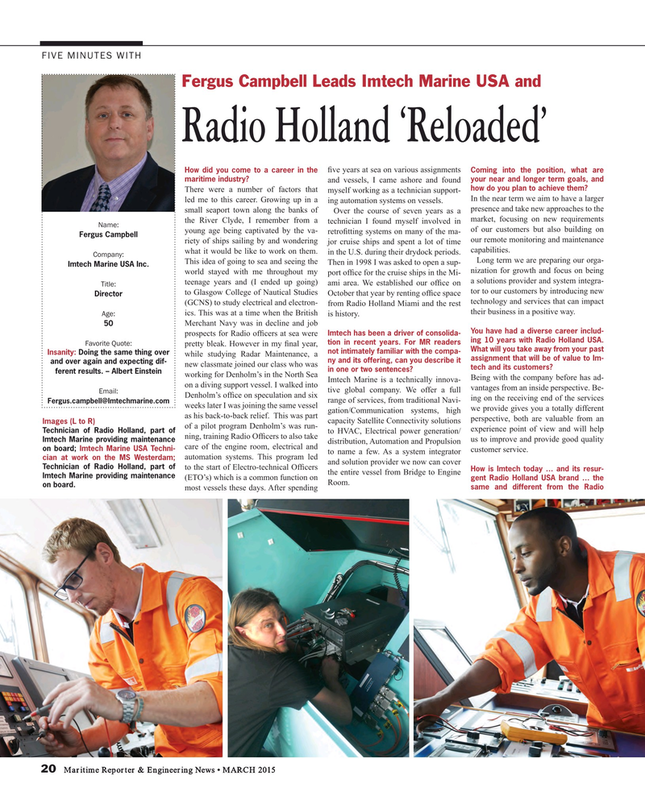 Director (GCNS) to study electrical and electron- from Radio Holland Miami and the rest technology and services that can impact their business in a positive way. ics. This was at a time when the British is history. Imtech has been a driver of consolida- prospects for Radio of? cers at sea were tion in recent years. For MR readers ing 10 years with Radio Holland USA. Insanity: Doing the same thing over while studying Radar Maintenance, a assignment that will be of value to Im- ny and its offering, can you describe it and over again and expecting dif- new classmate joined our class who was tech and its customers? in one or two sentences?